Continuing on with pentatonic scale patterns, Ian teaches patterns 4 and 5 and then shows what happens with the scale patterns after that. Learn the building blocks of the Rockabilly genre with Ian Argys. Ian introduces his Rockabilly series. 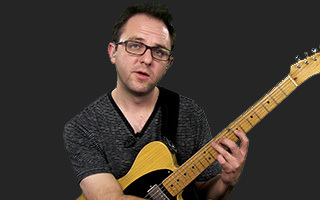 In this lesson, Ian introduces the 12-bar blues and includes a few variations on the form. Ian's simple straightforward approach will have you playing the blues in no time! By the end of this lesson, Ian will have you playing over a fun, 12-bar blues form with major and minor triads. In this lesson, Ian shows open and movable 7th chord fingerings that are useful for playing nearly any song, rockabilly and otherwise. In part one of his Pentatonic Scale Patterns lessons, Ian covers the first three (of five) patterns. Make sure you have these under your belt before moving on to the next lesson. In this lesson, Ian walks through how to shift and adjust the minor pentatonic scale patterns into major. This lesson brings together the triads, progressions, scales, hammer-on's and pull-off's covered so far in a familiar sounding blues form we'll call the "Moody Swing". In this lesson, Ian teaches a blues form in the style of Charlie Christian.